quarry, then this time will be counted as well as your on road driving. other work. After the break you can continue driving. 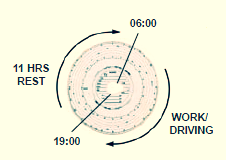 Within 24 hours of ending a daily or weekly rest period, a driver must have taken a new daily rest period. periods. Between any two weekly rest periods a driver may have, at most, 3 reduced daily rest periods. During the first hour of a double manned journey, it is not necessary for both drivers to be on the vehicle. hour of the first driver starting work. onto a ferry and off at the end of the sea crossing (depending upon the length of the crossing). • The total interruption of the rest period must be no more than 1 hour. Either a regular or a reduced daily rest period may be extended to become a weekly rest period. rest period must begin no later than 08:00am Sunday. chooses. The vehicle must be fitted with suitable sleeping facilities for each driver and must be stationary. nine persons, including the driver. Switzerland, Iceland, Norway and Liechtenstein. agreement. It is envisaged that the AETR and 'new' EC rules will be aligned in the future. Many of the exemptions from these Regulations are broadly similar to those in the previous legislation. 100km of the vehicles' usual base. exclusively for the non commercial transport of passengers. break of 30 minutes after four hour driving. This derogation will be removed after 11 April 2007. The drivers of these services will have to follow the break rules described opposite. Unit, or check the website. This poster has been designed to give an overview of the regulations coming into force on 11 April 2007.
regarding the legislation and its application you should consult an appropriately qualified legal advisor.